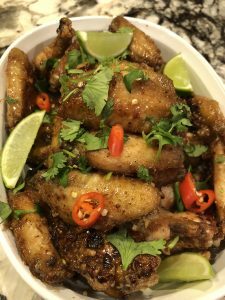 During football season…I love making anything chicken WINGS!! My whole family LOVES chicken wings and I have to say…this dish will be on repeat from now on. It is so good alone or with a HUGE BOWL of white rice and some sliced up cucumber. The fish sauce is thick and its SPICY!!! I think I am gonna try to use this fish sauce to make my PORK CHOP next week…and serve it with jasmine rice and a SUNNY SIDE up egg. YUMMY!!! 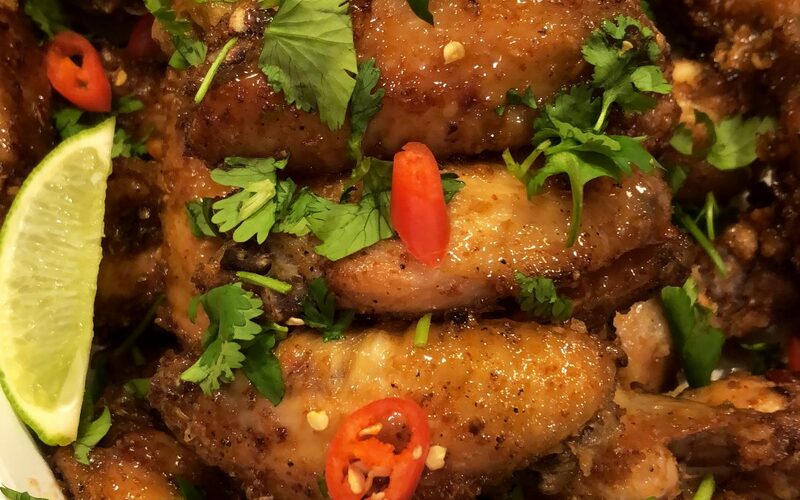 With this recipe…make sure that you DO NOT marinate the chicken with TOO MUCH SALT…because it will make the chicken wings just too SALTY!!! 1. Wash the chicken wing pieces with 3 quarts of water mixed with ¼ cup salt and 2 tablespoons white vinegar. Then drain and dry them with paper towels. 2. In a large bowl with a lid, add in the ginger, wine, pepper and mushroom seasoning and whisk to combine. Then add in the chicken wings coating every piece with the mixture, cover the bowl with lid and marinate for 1 hour in the refrigerator. 3. Pour the cornstarch into the marinated chicken, cover the bowl and shake it to coat all the chicken pieces with cornstarch. Make sure to shake off the excess cornstarch starch before frying. 4. Heat vegetable oil in a large pot over high heat or using an electric deep fryer. Oil will be ready for frying when you place a wooden utensil in the middle of the pot and you see bubbles in the oil. 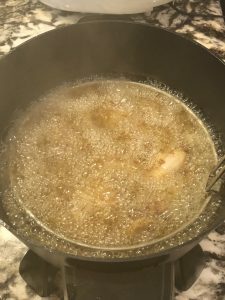 Deep fry the chicken in batches for about 10-12 minutes or until fully cooked (no longer pink at the bone and the juices run clear) and golden brown on all sides. Place them on paper towels to drain excess oil. 1. Pour fish sauce, sugar, lime juice and sliced Thai chili peppers into a small sauce pan and whisk until sugar completely dissolves. Turn heat on medium low and allow sauce to come to a light boil and remove from heat. Set aside. 2. In another small sauce pan over medium low heat add oil and minced garlic. Fry until garlic is lightly golden brown, about 5 minutes, and transfer to paper towels to drain. Set aside. Making sure the garlic is not burned because it will taste very BITTER. 3. Pour the fry chicken into a large bowl and add in the fish sauce mixture. 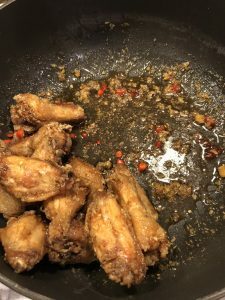 Mix the fry chicken wings and fish sauce until its nicely incorporated. Next, transfer to a serving platter and garnish with the fry garlic and chopped cilantro. Serve immediately.